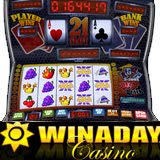 The new Slot 21 game at WinADay.com online casino is a combination of two casino favourites, slot machines and blackjack. First and foremost, it’s a kitschy, retro, arcade-style slot machine reminiscent of the old strip in Las Vegas. But it also has two bonus card games built into it. When the Red & Black scatter symbol appears on the right most reel, players have the option of playing the Red & Black Bonus Game where they can double the winnings of their last spin. A second bonus game within this new slot machine is inspired by Blackjack. By collecting Jacks, Queens, Kings and Aces on the slot machine reels players earn “21 Cash” which can then be used to play a hand of blackjack. When players draw cards that come closer to 21 than the bank’s hand, without going over, their wager is doubled. Five “crown” symbols wins the progressive jackpot which is currently over $170,000. The jackpot, which is tied to all of the slots games at WinADay.com, was last hit in March for $223K. Since it’s hit, on average, every six or eight weeks, many regular players at WinADay sense it is due for another big win any day now. Deuces Wild video poker is WinADay’s Game of the Month for May. Everyone that plays it is automatically entered in a draw for $500 in prize money. At the end of the year, all Game of the Month tickets will be entered in one draw for a Dell Studio 15 laptop. Last month WinADay launched a variation of another classic casino game. The new Roulette 5 is American roulette that’s as easy to play as a slot machine. With 5 wheels, this unique version of the classic casino game gives five chances to win on one spin and five times the thrills of regular roulette. Players choose the number of wheels to spin just as they’d select how many pay lines to wager on in a slot machine. WinADay.com now has 14 whimsical games: nine unique slot machines, four video poker games and one roulette game. They’re all instant play, no download games that are available only at WinADay.com.